07/05/95 - Arkansas, EEUU. Ganó una, tres 3eros. By STREAKIN SIX SI 104 (1977). Stakes winner of $473,937. Sire of 663 ROM, 75 stakes winners, $17,339,889, incl. champions SIXY CHICK SI 106, SIX FORTUNES SI 107, SIR ALIBI SI 104. Sire of the dams of 87 stakes winners, including champions AB WHAT A RUNNER SI 109 ($1,342,389 [G1]), KETEL WON SI 106 ($454,780 [G1]), SHAKE THE BANK SI 105 ($372,585), ROLLINTO MISCHIEF SI 105, and of STREAKIN FLYER SI 96 ($1,141,128). SWEET VICTRESS SI 89, by Victory Stride TB. Winner to 3, $3,162. A Tempting Chick SI 99 (f. by Chicks Beduino). 3 wins to 3, $36,953, 3rd Mission Beach S., Moss Landing S., finalist [R] [G1].Damof– A Tempting Dash SI 95 (g. by First Down Dash). 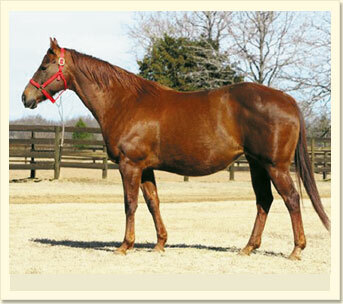 Winner at 2, 2008, $122,195; finalist in the Los Alamitos Two Million Futurity [G1]. Brazos Blush SI 94 (f. by Takin On The Cash). 5 wins, $24,077, finalist [G3].Damof ChicksOnThe Brazos SI 111 ($15,203, finalist [R][G3]. Tempted By Titles SI 91 (g. by Cash Legacy). 5 wins to 4, $14,037 in Mexico, 2nd The Quarter Racing Journal S., finalist [G3]. Rare Temptation (f. by Rare Form). Unplaced in 2 starts. Dam of– Snow N Texas SI 102. 2 wins to 4, $43,762, finalist [R] [G3]. BLUSHING BUG SI 108. 13 wins to 8, $185,573, Champion Prep S.
LYNNS ALLANTE SI 102. 7 wins to 5, $63,002, New Mexico Chlg. MAKEEMBLUSHSI 105. 4 wins to 4, $56,738, Garfield Poorboy Fut. Leaving Memories SI 111 (c. by First Down Dash). 3 wins to 3, $112,121, 3rdQHBCSophomore [G2]; finalist All American Fut. [G1]. Blushing Streaker SI 106. 10 wins to 8, $34,383, 2ndQHBCFuturity [R]. RACE RECORD: one win, 3 times 3rd. EARNED $6,033. '09- ER Ocean Six (Ocean Runaway) Padrillo en el Haras El Silencio.